One of the things I like about Winnipeg is that we have a rich history of readings being both a fun and at the same time useful resource. Many people have readers in their family history, people that didn't necessarily do this as a profession but still either worked with this gift or appreciate those who do. I think most people view it as something fairly down to earth. 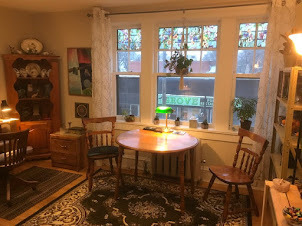 There are some great local resources for Tarot and intuitive study that don't charge unreasonable amounts and rank among some of the best in the world. Most Winnipeg readers are pretty ordinary folk who read constructively. Many of us who do work professionally also do some free (pro-bono) work and will also donate our time free of charge for charities etc. I frequently do shorter "psychic fair" style readings at events put on by Gio's Cares, a charity that helps people living with HIV / AIDS. I usually post to this site when these are upcoming. Part of doing what I do for as long as I have is having the ability to laugh at myself. I take what I do seriously, but I have to take me with a grain of salt and good friends help with that too, - (thanks Charley, particularly for your insights lately :). Years ago, when I was bumbling through an understanding of Tarot's relationship with the Qabbala (it's spelt a number of different ways before you correct me). 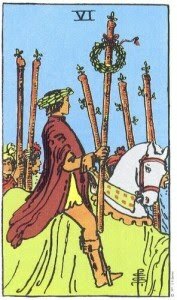 I found a curious relationship between the Knights and the Sixes, particularly relevant in the illustrations found in the Rider deck. All of the sixes show a modified force, a kind of conscious adjustment and responsibility of guardianship, things we would associate with the duties of a knight. Also position six in the Celtic cross, in my interpretation, is our first interaction of inner experience to the outer world. This position is where we often get our marching orders in terms of the evolution of our life path. So the sixes in the Rider deck give us a clue as to the responsibilities the knights have and their optimal function in each suit. If fives are disruption, sixes are a sense of working things out, not simply putting things back to where they were but with better understanding, helping things to evolve. The knight of wands has a challenging bucking bronco of energy that we see brought under close rein. The blanket covering the horse's lower body suggests a great underlying force. The figure has laurel wreaths of attainment and is moving in parade through a crowd. No one is being trampled. Ambitious force is being used constructively. 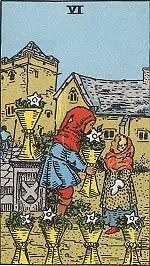 We can almost overlook the knight symbolism in the 6 of cups but he is there, doing sentry duty in the background as the childlike figures work to establish trust. He can be called upon if need be. Our sense of trust is brought into being through compassion and communication. 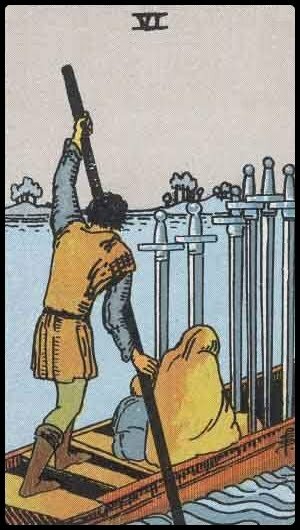 The six of swords is perhaps the most poignant in it's representation, the knight of swords who was so intense is like the guardian figure watching over the grieving hooded figure and the child who looks ahead to the future. Again undercurrents are suggested by the figure poling the boat (rather than rowing). This is done when we have to cross a current. The pole extends down to the very bottom of the river. By plumbing the depths of our reactions and undercurrents, we can safely work through extreme situations. The swords provide protection and the knight keeps balance through a time of great peril. 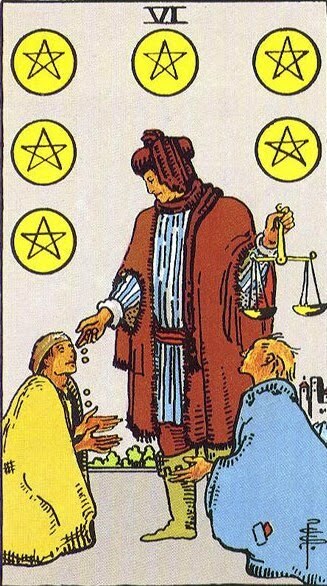 The knight of pentacles is epitomized like the charitable figure who measures carefully how much to give.This is not blind charity but a conscious sense of response to those in need. Rather than just keeping the beggars in poverty there is a sense of moving things along. I love congruence, the idea that a number or symbol has a unifying relevance. Some of the recent posts have been about the struggles of growth in using our gifts and strengths. Perhaps there is an aspect of all of us that is on a quest, finding it's way. I like to use the symbolism of the sixes, especially when there's upheaval (as seen in the fives) and I'm looking for that next right thing to do. I think these images are pretty good marching orders.